The Modern season is in full swing and as with every Modern season, there are bound to be multiple Modern cards spiking. It is easy to point fingers at perceived speculators buying out cards like Blood Moon or Jund mythics, but a more likely explanation is that we were watching market correction taking place in respond to the increased demand from an expanding Modern player base, as Corbin Hosler (@Chosler88) laid out in his excellent article a few days back. After all, new Modern players looking to grind the Modern PPTQs or Grand Prixes are likely to have to acquire their Snapcaster Mages, Cryptic Commands, Blood Moons etc if they want to run a tier one deck. The combo-infested caterpillar that was Modern in 2011 has, through an unpopular series of bannings, metamorphosed into the colorful, vibrant butterfly that is Modern in 2015. Modern is becoming more like Legacy, where the top 8 archetypes differ from week to week and from region to region. A format where familiarity with your deck far outweighs trying to out-level the metagame as most tier one and tier 1.5 decks stand a chance of making top 8. A common complain I hear about Modern is the format’s increasingly high barrier of entry, especially after the recent spate of price spikes. However a fact that is often overlooked is how a lot of these Modern staples in question were only mildly expensive for a long time before their recent spike. Snapcaster Mage was hovering around $25 for the majority of his life since he was printed in Innistrad and he was hovering around $35 for the better part of last year, before moving up to $40 this February. 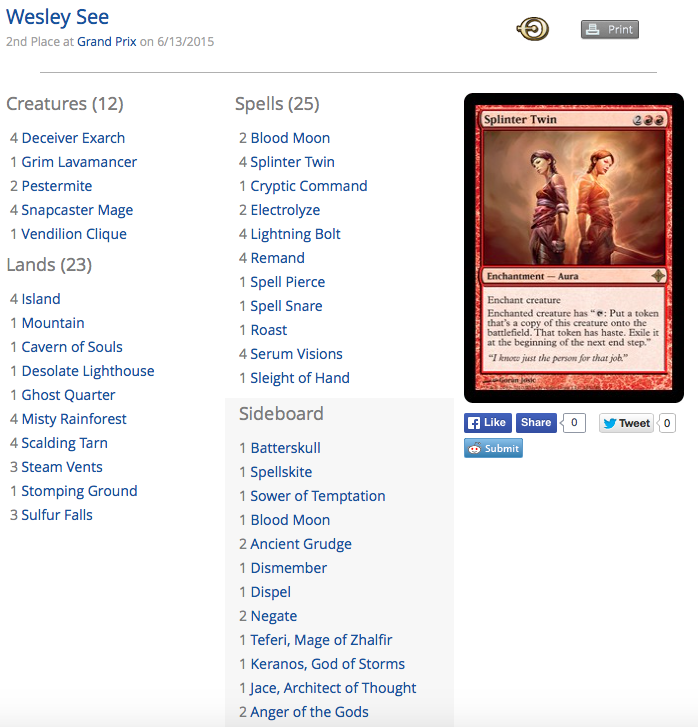 Blood Moon tanked to $7 when it was reprinted in Modern Masters and went on a slow but steady growth over the last two years. It only broke $20 at the end of last year and remained so until March this year. I can go on and on with examples, but you get the gist. In a way, buying into Modern is very much like buying into Legacy, as a friend and fellow mtgfinance enthusiast Reza (@rezaaba) once suggested to me. Like Legacy, one does not simply build a Modern deck within a day. Buying into Modern is a long-term effort that requires you to acquire key components strategically. That approach formed the idea behind this series of articles where we examine top Modern decks and find out which of their components are in their cheap phase now. I use the term cheap phase rather than cheap as the cards discussed in this article may not necessarily fit the definition of cheap, but they are in the price trough segment of their price cycle, and is probably the best time to get your own copies if you have been holding out. For example, I don’t think we are going to see Dark Confidant drop any lower than the $46 he is currently at, after the release of Modern Masters 2015. $46 would pale in comparison with his price two years down the road. Let’s start with the top two decks from last weekend’s Modern Grand Prix at Charlotte. The deck that took down the Grand Prix (though it would be interesting to see how the games would have panned out had the opposing Blue-Red Twin deck not been given a game loss for decklist error) and one of the new Modern archetypes spawned by the existence of Collected Company. A couple of the deck’s key components spiked hard after the Grand Prix, chiefly Ezuri, Renegade Leader who tripled in price regardless of the fact that he has two printings, and Cavern of Souls which was due for a spike anyway. I wouldn’t necessarily call Collected Company a good pick-up right now as its price is currently buoyed by the Modern hype surrounding it, but there are still a few key pieces of Elves that I think are going to be worth much more in the future. After all these month’s I’m still calling Chord as a pick-up. A number of my fellow MTGPrice writers called Chord of Calling a good pick-up. I myself wrote about Chord a few times, when Chord was $4. While Chord’s price bumped up slightly after Elves’ victory, $6 is still a good buy-in price, considering how Chord was once a $40 card. Chord is also found in multiples in Abzan Company. Modern rares that are played in multiple copies in multiple archetypes are going to be worth more than $6. Nettle Sentinel was under $1 until last weekend. 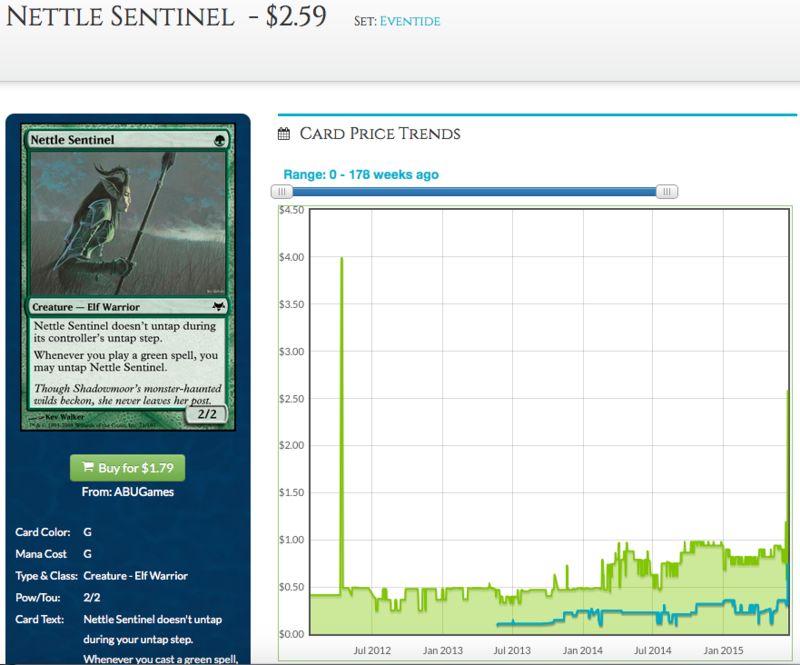 Now that Elves are a thing in Modern, Nettle Sentinel’s price shot up to $2.59. Yet I still think Nettle Sentinel has room to grow. Frankly I am surprised that a Legacy Elves centrepiece from a small set printed seven years ago could remain under $1 for so long. Now with the added demand from Modern, on top of the fact that Nettle Sentinel only has a single printing, picking up your own copies of Nettle Sentinel for under $3 does not seem to shabby. If there’s one deck that is the quintessential deck of Modern, it would be Blue-Red Twin. 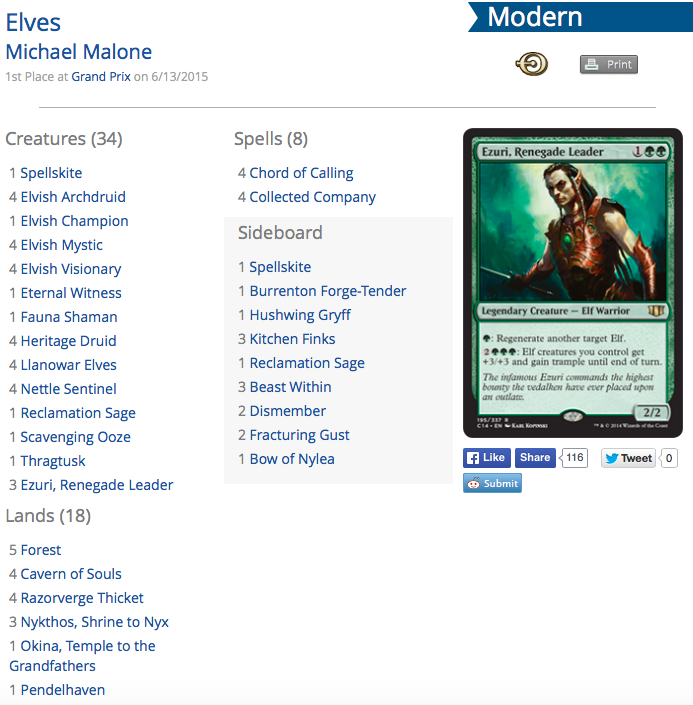 Twin was one of the few tier one decks that emerged in Modern’s first incarnation back in 2011 and remained a tier one deck up till today. It took down two out of the four Modern Pro Tours, survived the slew of bannings which killed off more tier one archetypes than I can recall, and some say Twin is the sort of deck Wizards likes to see in the format: a turn four deck that is also interacts with the opponent. While the Twin archetype has evolved from it’s initial combo-orientated game plan, adopting a tempo-based strategy with an infinite combo in which the opponent has to respect at all times (and together with it a playset of Snapcaster Mage), the core cards of the deck remained the same. 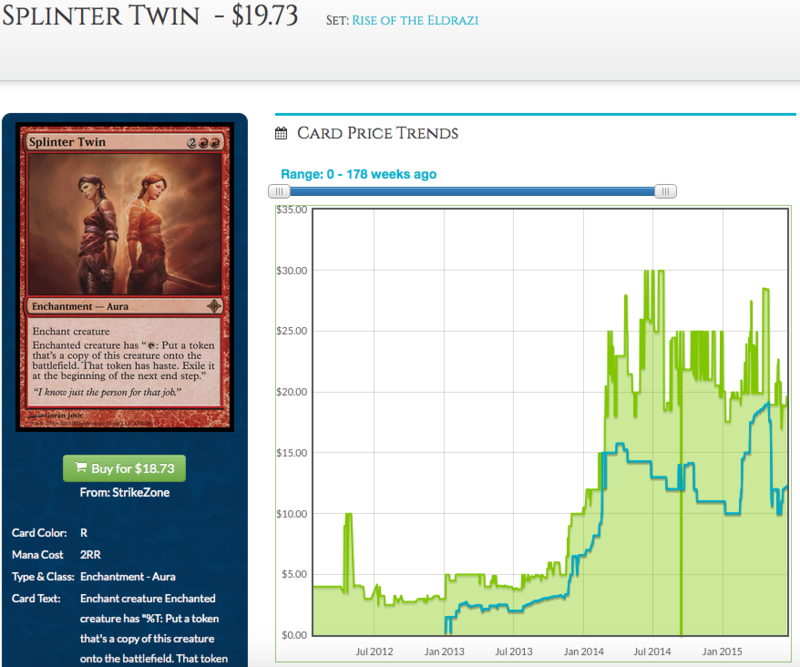 Surprisingly, Splinter Twin‘s price only broke the $10 barrier in December 2013 and prior to its Modern Masters 2015 reprint, it was still averaging around the low $20s. 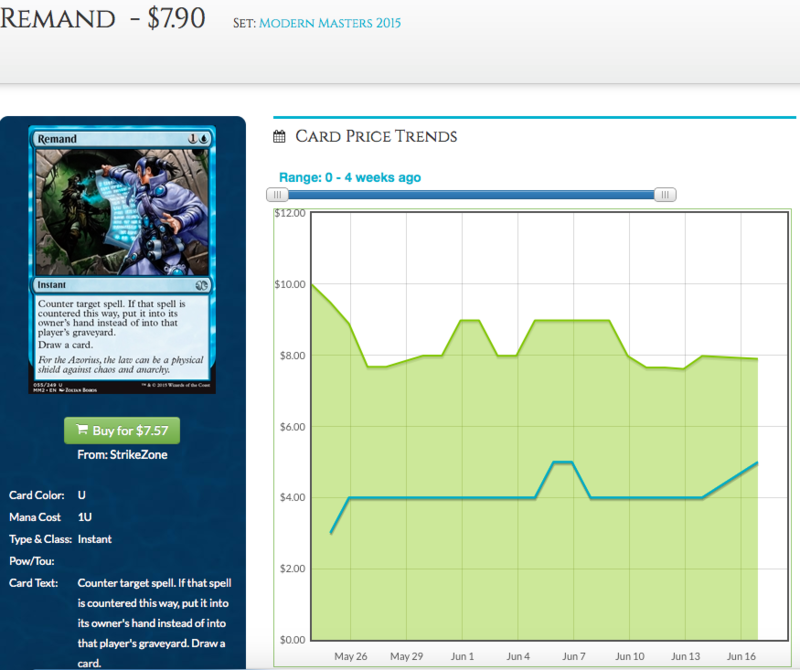 Splinter Twin’s recent reprint brought its price down a little, with the Modern Masters 2015 version trending at $17. If you are looking to get your playset of Splinter Twin, go ahead and get them now. With a Modern Masters 2015 reprint, I doubt we would see another reprint anytime soon. Gone are the days of under $10 or even under $15 Splinter Twin, but we have yet to arrive at the days of $30 to $40 Splinter Twin. 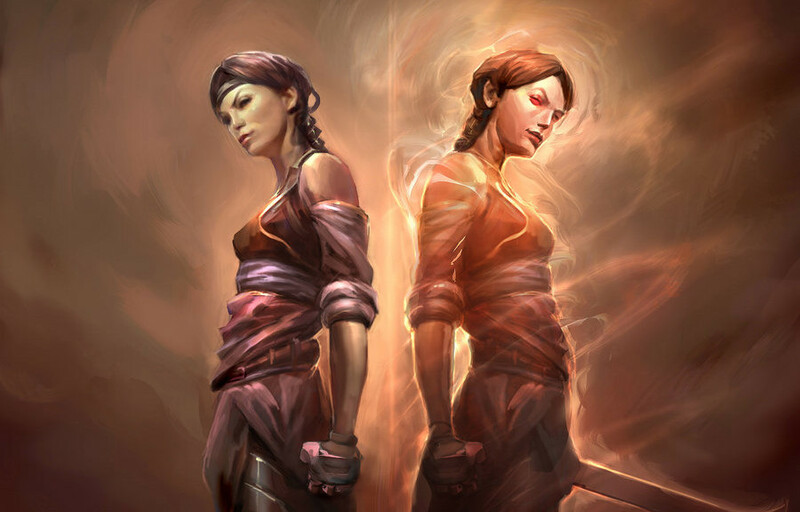 As the key component to one of Modern’s most popular deck, Splinter Twin will unlikely remain at $17 for too long. That’s it. Remand‘s price has finally hit its lowest point since 2012. 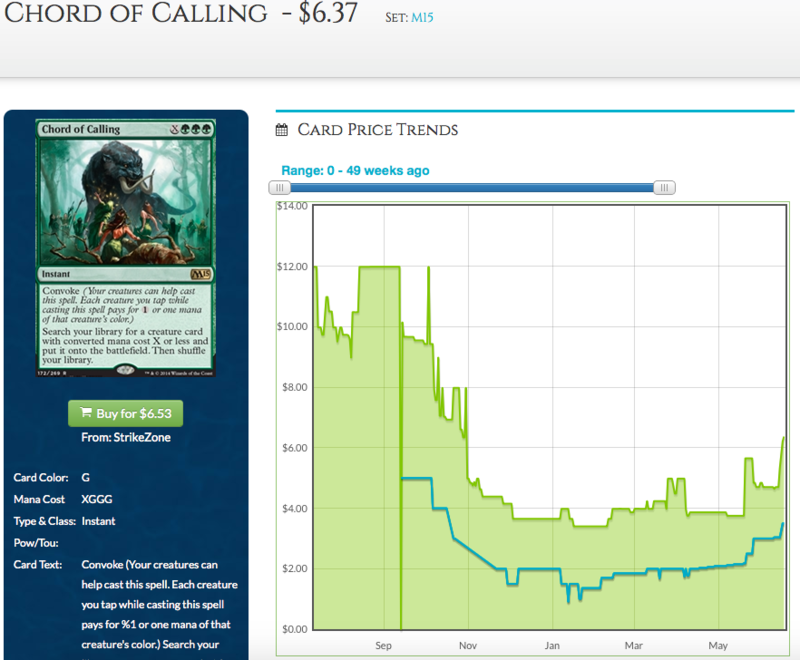 The Jace vs. Vraska printing brought the $17 uncommon down to $11 for while, but it started inching up again early this year and by April Remand returned to its old price of $17. After all, there is only so much the Duel Deck could do with a singular copy of Remand in each box. Amid the big name reprints and big spikes, the community seemed to have overlooked the fact that Remand is now close to it’s 2012 price. Yup, the most popular counterspell in Modern, the sixth most-played card in the format as of writing, is back to single-digit price. Now is the best time to pick-up your Remands, even if you are not planning to run Splinter Twin. It is one of the most ubiquitous blue card in Modern after Serum Visions and Snapcaster Mage. My prediction would be that by the next Modern PPTQ season in the summer of 2016, Remand’s price would be back in double-digit region. That’s all for this instalment of The Modern Watch. I would be rolling out the next parts throughout the next few weeks. We are in an exciting month for Modern. After a dearth of high level tournaments for nearly half-a-year, we are getting a slew of Modern events this month and new decks and techs are bursting out of the gates. With two more Modern Grand Prix – Grand Prix Copenhagen this weekend and Grand Prix Singapore next weekend – I can’t wait to see what new tech surfaces. My only hope is that no Grishoalband makes the top 8 of Copenhagen this weekend. I would be running that deck in Singapore next weekend and it would be nice not to have the deck in the crosshairs. Share your thoughts below or catch me on Twitter at @theguoheng.